European Union observers monitoring the second round of the presidential election in Mali have praised the country for holding a “legitimate” ballot that has helped the war-troubled nation move its democratic process forward. 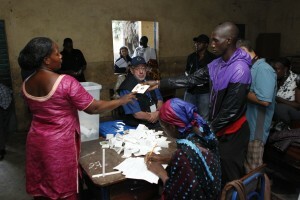 Louis Michel, head of the European Union’s electoral observation mission in Mali, highlighted the “substantial democratic progress” at the end of the vote on Sunday evening. “The one who will be elected will be elected with legitimacy, this is my conviction,” said Michel after assisting closing the polling station of Ecole du Fleuve in the area of Djicoroni Para, in the capital Bamako. Earlier in the day, millions of registered voters braved persistent rains and headed to the polls in the second round of presidential elections between former Prime Minister Ibrahim Boubacar Keita and former Finance Minister Soumaila Cisse. Some 77 per cent of the 6.87 million registered voters participated in the first round, which was held July 28 and included 28 candidates. The results are expected to be announced by August 16. France, which maintains a military presence to fight Al-Qaeda affiliated militias in the north, and the US are hoping that the election will stabilise Mali and help it play a greater role in removing the terrorist organisation’s presence in Sub-Saharan Africa. Mali descended into chaos in the wake of a March 2012 coup by military officers who were unsatisfied with the way the civilian administration was dealing with a Tuareg rebellion in the north. The military campaign in the north was halted thereby creating a vacuum, which was quickly filled by the Ansar Dine rebels who pushed back the Tuareg and then imposed a severe strain of Islamic law; they then began to capture towns in their southward push. On the request of the authorities in Bamako and with the blessings of the UN Security Council, the French army has since January 11 been engaged in a military operation in support of the Malian army against Ansar Dine and its Al-Qaeda affiliates.